The BJP on Thursday was set to form its first government in the northeast, ousting the Congress in Assam after its 15-year uninterrupted rule. 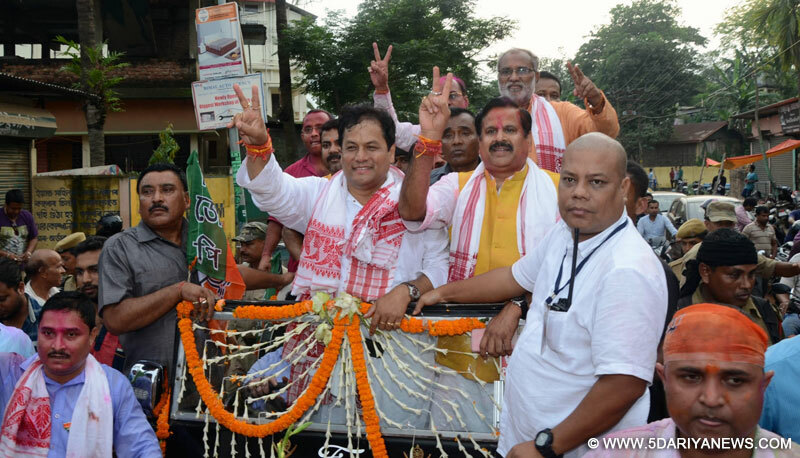 BJP chief ministerial candidate Sarbananda Sonowal promised that the new government would leave no stone unturned to fulfil the expectations of the people of Assam.With results still pouring in, the Bharatiya Janata Party alliance looks set to bag over 85 seats in the 126-member assembly.As per latest reports, the BJP has won 56 seats and is leading in four, while its alliance partners, Asom Gana Parishad has won in 12 and is leading in two seats, while the Bodoland People's Front(BPF) has won 10 seats and is leading in two. The Congress has won 23 seats, and is leading in three, while its partner United peoples' Party (UPP) has drawn a blank. The principal opposition party in the outgoing Assam legislative assembly, All India United Democratic Front (AIUDF) could win only 13 seats (11 won and leading in two) compared to 18 seats it won in the last assembly elections in 2011. The results have dashed the hopes of the AIUDF, which had hoped to play kingmaker.One Independent candidate, Misbaul Islam lascar also won from the Borkhola constituency in Barak Valley defeating Congress heavyweight Rumi Nath.Sarbananda Sonowal expressed happiness over the results and said the party would put in its best efforts to fulfill the expectations of the people of Assam. "The greater Assamese society in Assam spontaneously responded to the appeal of BJP and its alliance partners and it led us to victory. The people of Assam have been suffering due to the misrule of the Congress in Assam. So they supported the BJP and its allies to form the government," Sonowal said, addressing a press conference at the BJP headquarters here on Thursday evening. "The people of Assam wanted a change. They wanted their identities to be protected and protection of their culture, pride and tradition. So for this the people have supported us and we are going to fulfill the expectations of the people," he said, while assuring that the party is determined to carry out the Vision Document prepared ahead of the polls and ensure its timely implementation.Assam Chief Minister Tarun Gogoi accepted defeat and said the party will play the role of a constructive opposition in the Assam legislative assembly in the coming days. "We accept the mandate of the people. I thank the people of Assam for giving us three terms to serve them. Now the people want us to sit in the opposition and play the role of a constructive opposition and I thank the people for that," said Gogoi while addressing the newsmen. "It is only natural to feel bad about the result but I am not depressed. In democracy, one has to accept the verdict of the people and we have accepted that. We are going to try our best to play the role of a constructive opposition," he said. "I am thankful to the people that they have not abandoned the Congress completely. May be there are some shortcomings on our part or may be that the people have expected more from us than we delivered," he said. Gogoi said that he had already congratulated Sarbananda Sonowal for the victory. "It is a grand success for them. The BJP, the AGP and the BPF came together this time and won the polls," he said.Reiterating that he'll be still active in politics, Gogoi said that ups and down are the part of a politicians' life. "I have seen many ups and downs in all my life be it in the national politics or in Assam," he added.Gogoi said the party is going to analyze the loopholes and deficiencies of the party and also the factors that led the BJP and its allies to victory. The BJP win has given hope to the people that the saffron party will live up to its promises.The BJP has not only assured to end the existing corruption in Assam under the Congress rule but also to bring change and development and give employment to the youth of the region and end infiltration from Bangladesh by sealing the Indo-Bangladesh border. "The people of Assam have been frustrated at the corruption of the Congress government, particularly in the last term of the government under Chief Minister Tarun Gogoi. Although the Congress had also assured to seal the Indo-Bangladesh border and give employment to the people in 2001, nothing much changed in the three terms under the Congress government," Ananta Hazarika, a resident of Guwahati in Assam, told IANS. "The BJP's win means a lot to Assam. The Bangladeshi infiltration has not stopped even though 30 years have elapsed since the signing of the Assam Accord. Prime Minister Narendra Modi and Home Minister Rajnath Singh have assured that the Indo-Bangladesh border will be sealed to end the problem of infiltration," Rakesh Thakur, a resident of Central Assam's Nagaon district, told IANS while expressing hope that people like him will get employment.